CCRNs: This course is eligible for new synergy model Category C.
Written by Catherine M. Mullahy, The Case Manager’s Handbook, Sixth Edition is an indispensable guide for case managers. Presented in an accessible and conversational style, this practical resource helps case managers learn the fundamentals, study for the Certified Case Manager (CCM) exam, and advance their careers after the exam. Completely updated and enhanced with information on the latest developments, it reflects the rapidly changing healthcare landscape, including the significant effects of the Affordable Care Act. Note: This course is designed for Certified Case Managers and those wishing to take the CCM exam. Anyone may take it, although those with no prior case management experience may find it challenging. 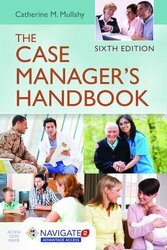 The Case Manager's Handbook consists of two sections, each worth 25 contact hours (total of 50 contact hours once you’ve completed both sections).